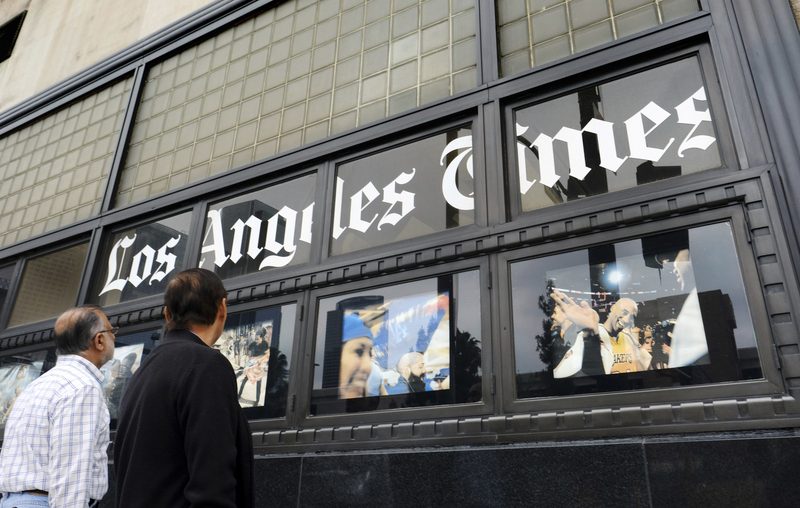 LOS ANGELES (CN) – Los Angeles Times managers have accused the newsroom’s union of not bargaining in “good faith” over contract negotiations and for withholding data used to compile a report revealing a pay gap at the newspaper for women and journalists of color. Union representatives say the management’s claims are a tactic to stall contract negotiations and deflect the issue of pay inequity at the newspaper, which was recently sold to Los Angeles entrepreneur Patrick Soon-Shiong for a reported $500 million. The negotiations, however, are between the union and the LA Times’ Chicago-based parent company Tronc, as the sale to Soon-Shiong has not yet been finalized, according to a Tronc representative. Earlier this year LA Times journalists voted to unionize for the first time in the paper’s 136-year history and formed their union guild, which represents about 400 editorial employees. During their union drive last year, journalists requested pay data from Tronc and compiled the information into a report that highlighted pay inequity for women and journalists of color. The union found those reporters are underpaid by thousands of dollars each year when compared to their white, male colleagues. Thursday’s filing from management with the U.S. National Labor Relations Board is brief and accuses the employee bargaining unit of not providing data related to the study. Unfair labor practice charges can be filed by both employers and unions during bargaining. The charge, filed by Washington-based law firm Jones Day, says management has requested the data from the bargaining unit since April 24. LA Times Guild co-chair Anthony Pesce said the charge is a “highly aggressive tactic” and a “laughably pathetic” attempt to deflect from Tronc’s “illegal and immoral behavior toward people of color and women” at the newspaper. He added Tronc can correct pay inequity by coming to the bargaining table. In a statement, Los Angeles Times management called the filing of the unfair labor practice charge “regrettable” but necessary for its first contract with the union guild. Carolina Miranda, co-chair with the LA Times guild and a staff writer, said the study was issued before Tronc sold the paper to Soon-Shiong. Miranda said that it’s important the staff followed up on the report after they published it. There was frustration and anger in the newsroom when the report was released but the results were not all that surprising, said Miranda, a Latina woman who writes about art and culture for the Times. Pay equity has been one of the main talking points for the union efforts in the newsroom, as they highlighted executives who received golden parachutes. Former Tronc chairman Michael Ferro was reported to have received a $15 million payout for his time with the company, according to an investor report from Tronc earlier this year. Miranda added while pay inequity at the newspaper did not start under Tronc’s watch, it does have the opportunity to fix the issue. An email to Tronc seeking comment was not returned by press time.